[S843] United States Federal Census, Washington, District of Columbia, Population Schedule: Kokomo, Howard, Indiana; Emuneration District: 17, Supervisor District: 6, Sheet: 22B, Dwelling: 533; Family Number: 542, Date: 1930. Wanda Maxine Bagwell was born on 23 August 1920 in Indiana.1 She was the daughter of Parker Scott Bagwell and Hazel Dell Layden.1 As of 14 February 1940,her married name was Gifford. Wanda Maxine Bagwell married Charles William Gifford on 14 February 1940 at Kokomo, Howard County, Indiana.2 Wanda Maxine Bagwell and Charles William Gifford were divorced. Wanda Maxine Bagwell lived in 1978 in Kokomo, Howard County, Indiana.2 She died on 25 July 1992 in Greentown, Howard County, Indiana, at age 71. She was buried at Crown Point Cemetery, Kokomo, Howard County, Indiana. [S833] John W Bagwell Grave Stone, Find a Grave, www.findagrave.com. [S924] Ed and Debby's Website, Cemetery: Crown Point Cemetery (Howard County, IN). Walter Max Bagwell was born on 4 May 1927 in Kokomo, Howard County, Indiana.1 He was the son of Parker Scott Bagwell and Hazel Dell Layden.1 Walter Max Bagwell married Ava Lee Brock on 19 March 1945 at South Bend, St. Joseph County, Indiana.4 Walter was a veteran of the U.S. Air Force, serving from 1947 to 1949. He was stationed at Tinker Field in Oklahoma. Walter Max Bagwell lived in 1978 in Greentown, Indiana.2 He died on 28 February 2010 in Northwoods Village, Kokomo, Howard County, Indiana, at age 82 Walter Max Bagwell 82, Kokomo, passed away at 6:45 a.m. Sunday, Feb. 28, 2010 at Northwoods Village. Walter was born May 4, 1927 in Kokomo, to the late Parker Scott Bagwell and Hazel Dell Bagwell (Layden). His marriage to Ava (Brock), who preceded him in death on March 21, 2003, was on March 19, 1945 in South Bend, IN. Walter was a veteran of the U.S. Air Force, serving from 1947 to 1949. He was stationed at Tinker Field in Oklahoma. When he was younger he boxed in the Golden Glove. He liked boxing, playing cards, and golfing at the American Legion. Survivors include, five daughters; Patty Walker, husband Gerry, of Kokomo, Jan Powell, and husband Ron, of Kentucky, Sherry Herbst, of Indianapolis, Anita Ahern, and husband Kevin, of Carmel; Carol Plant, and husband Tom, of North Carolina, four sons; Lester Bagwell, wife Janette, of Kokomo, Steve Bagwell of Indianapolis, Gary Bagwell, of Kokomo, John Bagwell of Indianapolis, a brother and sister-in-law, Donald Eugene and Betty Bagwell of Kokomo, twenty grandchildren, and twelve great-grandchildren. Walter was preceded in death by his parents, wife Ava, a grandson, Chad Walker, two sisters; Wanda Gifford, and Dorothy McClain, five brothers; Lester, Kenneth, John, Robert, and Marvin Bagwell. Visitation will be from 11:00 a.m. to 1 p.m. Saturday, March 6, 2010 at Ellers Mortuary Webster Street Chapel, 3400 South Webster Street. A memorial service will be at 1:00 p.m. Saturday, at the Mortuary with Pastor Jeff Harlow officiating. Burial will be at Sunset Memory Gardens Cemetery. There will be full military honors provided by the U.S. Air Force and the Kokomo military rites team at the Cemetery. In lieu of flowers the family is requesting that donations be made to the American Cancer Society. He was buried at Sunset Memory Gardens, Kokomo, Howard County, Indiana. Chester Matthew Cannon was born on 9 January 1895 in Sidney, Illinois. 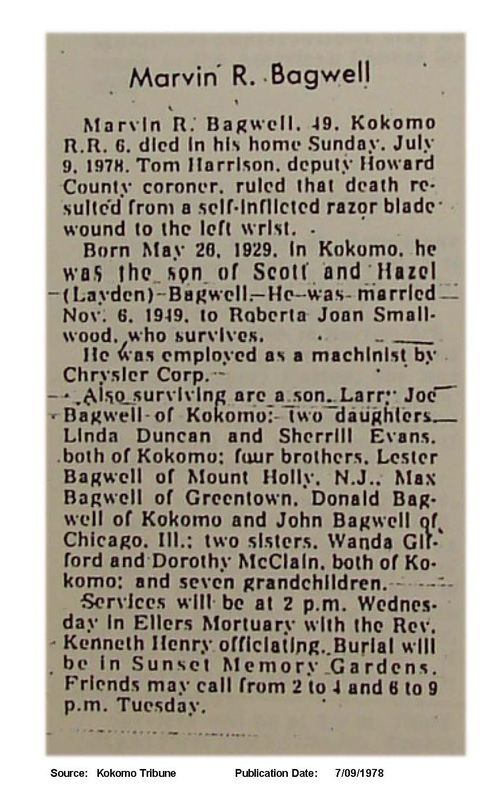 He married Thelma B. Bagwell, daughter of John William Bagwell and Sarah Ellen Carr, on 13 October 1923.1,2 Chester Matthew Cannon died on 17 January 1977 in Greentown, Howard County, Indiana, at age 82. [S690] Thelma Cannon, Number: 303-46-5231, SSDI: Thelma Cannon, unknown series. Nora King was born circa 1881 in Indiana. As of circa 1904,her married name was Bagwell. She married Carl Russell Bagwell, son of John William Bagwell and Sarah Ellen Carr, circa 1904. Nora King and Carl Russell Bagwell were divorced between 1910 and 1920. Pauline Deere was born on 27 October 1885. As of 4 December 1906,her married name was Bagwell. She married Nicholas Oscar Bagwell, son of Reverend Nicholas Eubanks Bagwell and Emaline Emma Patrick, on 4 December 1906. Pauline Deere died on 22 March 1954 at age 68. Lucile Energine Bagwell died on 15 January 1875. She was born on 15 January 1875. She was the daughter of Reverend Nicholas Eubanks Bagwell and Emaline Emma Patrick. Pleasant Gilmer Bagwell was born on 4 April 1876 in Montgomery, Tennessee. He was the son of Reverend Nicholas Eubanks Bagwell and Emaline Emma Patrick. Pleasant Gilmer Bagwell married Lella Ruth Coleman on 29 November 1900. Pleasant Gilmer Bagwell married Martha ( Mattie) Eufrazier Harper Seay in October 1925. Pleasant Gilmer Bagwell died on 12 May 1960 in Nashville, Davidson County, Tennessee, at age 84. Lella Ruth Coleman was born in 1864. As of 29 November 1900,her married name was Bagwell. She married Pleasant Gilmer Bagwell, son of Reverend Nicholas Eubanks Bagwell and Emaline Emma Patrick, on 29 November 1900. Lella Ruth Coleman died on 30 June 1923 in Allensville, Todd County, Kentucky. Martha ( Mattie) Eufrazier Harper Seay was born in 1891. As of October 1925,her married name was Bagwell. She married Pleasant Gilmer Bagwell, son of Reverend Nicholas Eubanks Bagwell and Emaline Emma Patrick, in October 1925. Martha ( Mattie) Eufrazier Harper Seay died on 27 August 1972. James Gilbert Bagwell was born on 4 April 1876 in Montgomery, Tennessee. He was the son of Reverend Nicholas Eubanks Bagwell and Emaline Emma Patrick. James Gilbert Bagwell married Laura Warfield on 16 November 1901. James Gilbert Bagwell died on 25 January 1965 in Allensville, Todd County, Kentucky, at age 88. Laura Warfield was born on 19 July 1879 in Springfield, Robertson County, Tennessee. As of 16 November 1901,her married name was Bagwell. She married James Gilbert Bagwell, son of Reverend Nicholas Eubanks Bagwell and Emaline Emma Patrick, on 16 November 1901. Laura Warfield died on 19 May 1922 in East Los Angeles, California, at age 42. Cora Bagwell was born on 1 July 1903 in Kentucky. She was the daughter of James Gilbert Bagwell and Laura Warfield. Cora Bagwell died on 9 February 1985 in Hopkinsville, Christian County, Kentucky, at age 81. Edna Bagwell was born on 9 December 1905 in Tennessee. She was the daughter of James Gilbert Bagwell and Laura Warfield. As of 12 December 1922,her married name was Wahrman. Edna Bagwell married Frank Charles Wahrman on 12 December 1922 at Los Angeles, California. Edna Bagwell died on 28 October 1984 in Denison, Crawford County, Iowa, at age 78. Frank Charles Wahrman was born on 5 November 1903 in Philadelphia, Pennsylvania. He married Edna Bagwell, daughter of James Gilbert Bagwell and Laura Warfield, on 12 December 1922 at Los Angeles, California. Frank Charles Wahrman died on 21 September 1982 in Denison, Crawford County, Iowa, at age 78. Jessie D. Snyder was born between 1865 and 1888. 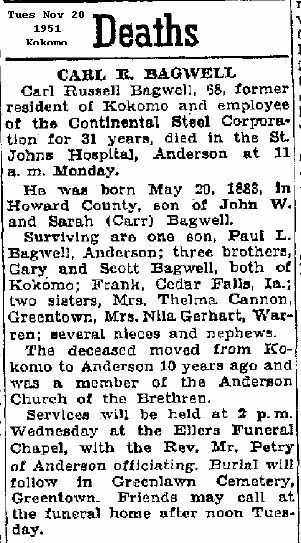 As of 23 November 1904,her married name was Bagwell. She married Calvin Elmer Bagwell, son of Reverend Nicholas Eubanks Bagwell and Emaline Emma Patrick, on 23 November 1904. Jessie D. Snyder died between 1911 and 1977. (?) McNealy was born between 1831 and 1851. He married Ellen E. Bagwell, daughter of Major Pleasant B. Bagwell and Nancy Morrow, in 1862. (?) McNealy died between 1866 and 1937. Mary McNealy was born between 1866 and 1889. She was the daughter of (?) McNealy and Ellen E. Bagwell. Mary McNealy died between 1871 and 1973. Charlie McNealy was born between 1866 and 1889. He was the son of (?) McNealy and Ellen E. Bagwell. Charlie McNealy died between 1871 and 1970. Jenny Larkin was born between 1858 and 1878. She was the daughter of J. M. Larkin and Emmaline Virginia Bagwell. As of between 1874 and 1915,her married name was Heard. Jenny Larkin married James C. Heard between 1874 and 1915. Jenny Larkin died between 1880 and 1964. James C. Heard was born between 1848 and 1877. He married Jenny Larkin, daughter of J. M. Larkin and Emmaline Virginia Bagwell, between 1874 and 1915. James C. Heard died between 1880 and 1958.